After my post 'What it means to be a black mother', I thought it would be a good idea to blog about some of the practices I have learned after taking care of Ruby's hair since she was born. When Sebastian was born I let his hair grow until he could talk (old Jamaican practice) and then promptly shaved it off as soon as I could. He has recently asked me to grow his hair like his friends at school (who are all white) and I agreed as I wanted him to decide how he wanted to wear his hair. When children with afro hair are babies the hair is sometimes soft and fine and you may find yourself washing the puke and paint etc out of their hair often. As they get older this hair will fall out and be replaced with the zigzag/curly hair that many people think is difficult to manage. Between the ages of 0 and 4 you may find it difficult to wash and or comb your childs hair as they wriggle to free thmselves from you or complain about water in the their ears or stamp and splash water on you or just generally scream. This ordeal is normal for parents across the spectrum. You will therefore be relived that black hair does not need to be washed that frequently as the scalp does not produce as much oil naturally, as other hair types. Once or twice a week should be more than enough. For bi racial kids whose hair may produce more oil this can be twice a week to more often. Both Sebastian and Ruby are mixed race but as Sebastian's hair is more dry and curlier and Ruby's I tend use shampoo on his hair once a week and hers twice. I found that shampooing Sebastians hair too often made it very dry. At around six months the hair your baby is born with will fall out. This hair will then grow back but may be a different in texture or colour. For black children it is important to take care of their scalp at this stage so that when their hair does grow back it will be healthy. Wash the hair with shampoo once a week, using a gentle baby shampoo. Air dry the hair, try not to use a blow dryer or heat applianace on the baby's hair and let it dry naturally. Apply a small amount of a natural oil to the scalp. A light oil like Olive Oil(virgin), Carrot Oil or Grapeseed Oil would be benefcial. Do not try to pull hair tight into clips or barrettes, these pull on the scalp. Try to leave it free if possible. If you need to use clips or barretes use cloth covered ones. Only comb the hair when it is damp and use a spray bottle to wet the hair so that you can style it. I would however leave a six month olds hair free and not try to style it too much. At this stage our baby/toddler/child will now have lost their baby hair which will have been replaced by curly afro hair. The baby hair may stil be present on the ends of the hair and may start to cause some tangling. Around a year and a half depending on the child it may be necessary just to trim these last vestiges of their baby hair off so as to avoid tangles as this hair is a different texture to their new hair. The first thing you will need to do is detangle the hair. This may be easier at first when they have less hair but as the hair grows after they turn two, detangling properly is necessary. Divide the hair into four parts. If you can leave a part at the front or side for your child to help you this gives them a chance to play with their hair and get used to taking care of their hair later on. It also allows then to get to know and love their hair at an early age. Using a spray bottle of water, spray the first section with water ad then apply conditioner to that section. Gently use your fingers to detangle this section. If the hair is long enough you can twist the hair or plait it loosely. You will find this easier if the child's hair is in a protective style like canerows but if it has been left out detangling is essential as the hair can get knotted very easily. Use a conditioner to help with detangling. If you are not planning to wash the hair you can use a leave in conditioner to aid with detangling. When shampooing hair concentrate on the scalp on my own hair I use the rule 'Shampoo roots, Condition ends' This just means you want to concentatrate on the roots and scalp while you shampoo. Use a SLS free mild kids shampoo. 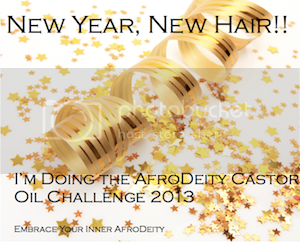 If you can, use one designed for afro hair. Use a small amount of shampoo, I have found on my own hair and my own kids hair that using too much shampoo can really dry your hair out. A little goes a long way. When you are washing the shampoo out it will run down the hair strands and cleanse them too. Condition the hair with the afro children's conditioner of our choice if you are able to find one or a mild children's conditioner. Once the child turns around two use a diffuser on a hair dryer on a cool or very low setting to help dry the hair. I only use a hair dryer when I do not have time to air dry at night especially in the cold winter. At night I try to finger detangle my daughters hair. As she is mixed race and her particular hair type is difficult to canerow and it will not stay for very long so I style her hair every two days. When she is older and has more hair this may be easier to do. I finger detangle with a leave in conditioner and plait or twist it into 4 sections. When she wakes in the morning I put her hair loosely in two scrunchies, but on my son's hair which is thicker and curlier I would have to plait it. Moisturise hair with a leave in before bed. My son is an avid swimmer, he swims once a week. before he goes to swim, I spray his hair with water and massage it in and then massage in Grapeseed Oil. Once he is finished I use shampoo to wash his hair. I use one that contains citric acid or phytic acid that will remove the chlorine. If this is not a moisturising shampoo, you may need to wash again with a mild moisturising shampoo. 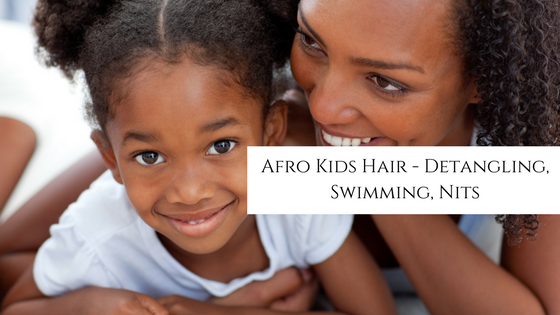 It is probably not a good use to use adult swim shampoos on children they can be quite harsh on young developing scalps and especially on fragile afro hair. I then use a conditioner and try to get him to leave this on for 5 -15mintes. If you can wash the hair when you get home so you can slowly go through all these steps. Also remember to wash and lotion the child skin carefully as chlorine can be damaging for skin too and make it excessively dry. This was a hard one for me as I never had head lice as a child and I have read that it is actually harder for the lice found in Europe to infest afro hair. That being said my two children both got head lice when there was infestation at school! Ewww! Most disgusting thing I have had to tackle with hair so far. On what I have researched and read, braiding, canerowing and plaiting the hair can make it more difficult for the lice to get into the hair. However once it has gotten into the hair you may have to use medicated shampoo to kill them. I used a moisturising shampoo after this and conditioned their hair as I would after swimming. I am still looking for a good natural lice treatment as I dont think I would want to use that awful medicated stuff on their hair again. 1. Jamaican Black Castor Oil and Tea Tree Oil as detailed in the blog post here. If there is even a hint of a child having lice in with or my children's classes i now just do a very quick prepoo with Jamaican Black castor Oil and job Done, No Lice in 3 years now. In the event of actual lice in their hair and would mix Jamaican Blacl Castor Oil with a few drops Tea Tree Oil and this smoothers and kills them. Great Natural Remedy. The Jamaican Mango and Lime has a version with Tea Tree already in it. I haven't said a lot about styling as that can depend on individual hair. My daughter and son require two different styling regimes which I will have to go into in another post. Don't be afraid to leave your child's hair out in a scrunchy or twist it instead of plaiting. Just remember gentle detangling and moisture, moisture, moisture! I hope this is helpfully to some extent!! Here is a badge for those of you taking part! 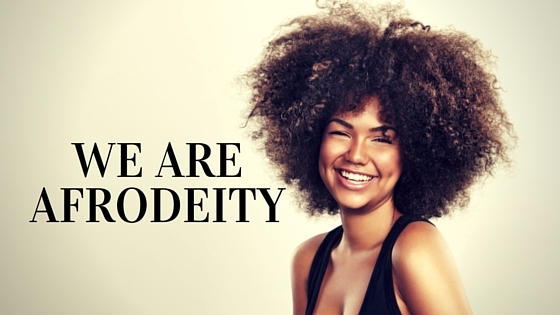 The most important thing to us at AfroDeity is that you enjoy the whole experience and get to meet other people on the same journey as yourselves. Look out for the Pinterest Treasure Hunt!